Preventive maintenance (PM) is a major type of industrial maintenance that deals with maintaining equipment on a regular basis. The prime objective is to prevent failures and other equipment problems before they take place. It’s a technical process to analyze and optimize schedules of maintenance and throughput adjustments in a manufacturing system. 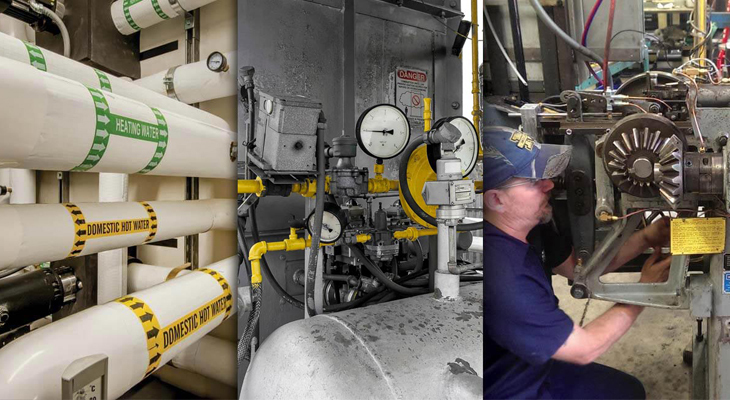 Throughput changing operations and scheduling of maintenance can maximize the cost benefits of maintenance operations in a situation where machines can perform their functions under different settings. Routine maintenance activities are performed while manufacturing systems and equipment is in service. It’s less stressful to budget and schedule these activities. Traditionally, routine maintenance is scheduled on meter-based or time-based schedule derived from predictive or preventive maintenance strategies. Cleaning, visual inspection, functional tests, lubrication, measurement of operating quantities and oil tests are some of the examples of routine maintenance activities. Maintenance testing involves the use of test equipment to examine conditions in the offline state. These activities are predictable and easy to schedule and budget. A maintenance team may schedule them on a meter or time basis. As maintenance testing is a set of predictable activities, some organizations consider them preventive or routine maintenance. Unbalanced gate testing and governor alignment are two of the examples of maintenance testing. In some situations, it becomes necessary to examine the condition of equipment after unusual events such as replacement, repair, or equipment failure. Diagnostic testing is also used when the equipment has to be tested for deterioration. It’s not possible to schedule diagnostic testing activities. Most companies budget for these events in advance to comfortably manage such situations. Vibration testing, governor troubleshooting, and unit balancing are some examples of diagnostic testing. Comprehensive and current documentation is a key part of an effective maintenance program. Whether your staff is performing predictive, preventive, reliability-centered or proactive maintenance, it is critical to document performed activities and equipment condition. Keeping track of every activity will help you refine your schedule. Recommendations can be used to plan future maintenance strategies based on the current condition of your machines. When your team keeps maintenance records, it becomes easy to access the maintenance history of each piece of equipment at all times. From routine check-ups and lubrication to work done during overhauls and replacements, a sound preventive maintenance plan keeps a record of everything. Carrying out maintenance on industrial mechanical equipment can be hazardous. Only professionals can deal with such technical jobs. Ignoring safety measures, when dealing with mechanical or electrical energy, can cause serious injury or even death. Therefore, it’s necessary to perform all maintenance activities in a strictly professional manner and in accordance with the safety rules and codes. If you don’t have a well-experienced maintenance team to plan and execute preventive maintenance strategies, hire a professional maintenance company. Quality Millwright is one of the top-rated engineering companies in Edmonton where we provide dependable preventive maintenance and shutdown services to a broad range of industries. Contact us for more information!